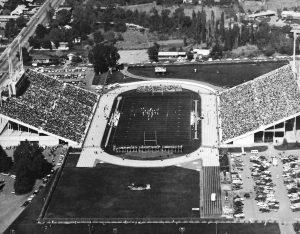 The replacement for BYU’s hillside stadium, the 33,000-seat Cougar Stadium opened in time for the 1964 football season. Remodels over 55 years have added north and south end zones and another 30,000 seats to what would be renamed LaVell Edwards Stadium; a 2019 update will connect the stadium corners. It’s a trick to plan any BYU performing-group tour. Check out how they did it in 1963—with lots of toy busses. The 1953 Cougarettes march in the Smith Fieldhouse. The 1907 BYU Mandolin and Guitar Club specialized in dance music.